RFID Press Releases - Beta LAYOUT Ltd.
Two years ago Beta LAYOUTs Embedded RFID technology, named Magic-PCB®, was patented in the USA. In a continuing process Beta has evaluated this technology according the US safety standards for Electronic products. As they have recently obtained the Certificate of Compliance from the Underwriters Laboratory they now meet the requirements of the industry. 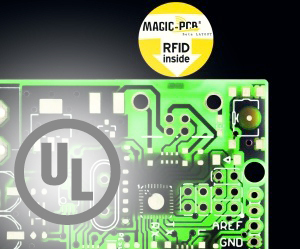 Magic-PCB® is an identification solution for the electronic industry. By embedding an RFID module into the Printed Circuit Board, every PCB is identifiable from the cradle to the grave. RFiD simplifies identification by eliminating the need for barcodes and line of sight creating a systematic and thus more efficient solution. Each RFiD module has a unique identifying code and a user memory. Typical fields of application are process control, product security and recycling. This technology is available for prototype PCBs and small volumes using the PCB-POOL® service. High volume production is also possible under license using a specially developed application machine. Industry 4.0 does not work without smart objects. Something like a PCB with an embedded UHF RFID tag represents the ideal data medium. Murata supplies the MAGICSTRAP RFID module while Beta LAYOUT has succeeded in industrializing the embedding method with an application machine. The new development can be seen for the first time at productronica. The centerpiece of the method for which a patent has been filed is the Magic Application Machine - the name is derived from MAGIC-PCB - developed by Beta LAYOUT with the aid of subsidies from the Federal Ministry of Economics and Technology. The MAM, as the machine is commonly known, automatically embeds RFID chips in the FR4 PCB material. To do so, a slot is cut in the PCB into which the RFID chip is embedded at the edge of the board. 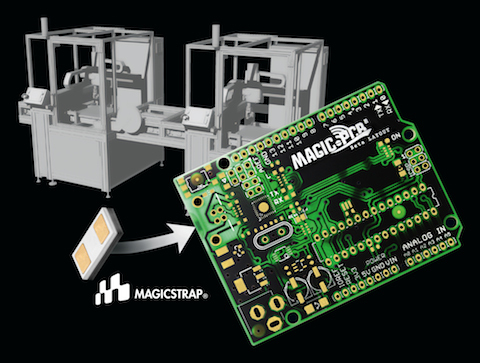 This enables the MAGICSTRAP to already be integrated as an RFID component in series PCB production. The chip is coated with epoxy resin, which means it is permanently embedded in the PCB and almost indestructible. The chip does not need much space either, as it is only 3.2x1.6mm in size. Beta LAYOUT currently offers the technique as an in-house service. Going forward, Beta LAYOUT will make the method available to other PCB manufacturers under license. The machine for the embedding process is manufactured by the mechanical engineering firm Schmoll. The first example is scheduled for delivery next year. The Magic Application Machine will then be able to produce the RFID MAGIC-PCBs under license from Beta LAYOUT anywhere in the world. If the embedding technique is not an option, or the UHF RFID module is to be retrofitted, it is easy to insert and solder the Murata module on the PCB as an SMD component using the standard SMT process. The PCB is converted into an RFID tag at this moment, enabling it to act as a smart object. A PCB with a memory fits perfectly with the Industry 4.0 concept of an integrated, networked product lifecycle: “Outsourcing processes have led to a loss of transparency in manufacturing. This can be restored using by standard technology,” emphasizes Schmoldt. This insight, believes Schmoldt, stems from everyday practice in various industries where RFID is already successfully employed rather than business theory. Schmoldt cites the fashion and clothing trades as typical industries alongside paper production and the steel and automotive sectors. “In these areas, using RFID to control and monitor processes is already standard,” says the RFID expert. According to Schmoldt, however, the electronics industry is surprisingly only just starting to discover the field for itself, although the pace is picking up quickly right now. “Technical implementation is no longer a problem either, thanks to products like the MAGICSTRIP from Murata. In fact, this product delivers precisely the conditions needed for the migration of electronics to Industry 4.0,” comments Schmoldt. Whatever else, the RFID technology has already made it into production facilities in a number of places around the world, with EMS firms like Letron, Cerler and Jabil already boasting assembly lines featuring UHF RFID readers. “What's more, all automotive OEMs already employ UHF RFID to control their manufacturing,” emphasizes Schmoldt. As is so often the case, the automotive industry could once again be sending a clear message top-down to the other players in the value chain. Beta LAYOUT has put together a starter kit to help evaluate the MAGICSTRAP. Right now, more than one of these kits is being shipped to a new company in Europe every day, and the numbers are rising fast. And who pays for all this? Even though the individual module is not actually that expensive, the cost of an additional component in series production can be quite considerable. So everyone involved across the value chain needs to pull together, which is likely to represent a much greater challenge than implementing the technology. “Given the fact that value added in the electronics industry is generally highly fragmented, and that the outsourcing processes of recent years have led to the individual stages in the product lifecycle being carried out by different firms, it is very important for these individual players to reach agreement in a discussion of cost-sharing,” Schmoldt demands. The OEM frequently gains the greatest benefit from RFID, while the commissioning firm or partner company generally bears the cost of setting up the infrastructure. “However, the existing RFID facilities demonstrate that, at the end of the day, everyone benefits if they all seek to accommodate each other,” Schmoldt affirms. MUNICH -- Productronica was off and running today, with 03015 packages the clear winner among the technical discussion trends. Attendance was generally strong all day on the assembly side, while the fabrication hall (singular) was light bordering on sparse. For those readers who have not been to Productronica, it is massive. It occupies six large convention halls, most of which are tightly packed with booths. Unlike Asian or other Western shows, most exhibitors are grouped according to their products. Thus, for instance, if one were looking for digital microscopes, they could choose from the likes of Leica, Tagarno, Optilia and so on, side-by-side along the same wall. One hall is dedicated to test and AOI: Agilent, Aeroflex, atg, Goepel, JTAG, Landrex, Omron, Seica, Sonoscan, and Teradyne are among scores of vendors duking it out for visitors. There's no hiding from the competition here. Also, if the 2013 show looks similar to years' past, one reason may be because several exhibitors opted for the same booth locations as in 2011. That said, the fab presence seems to shrink every year. There were clear crowd-pleasers, however. Beta Layout drew attendees to its embedded RFID technology, for instance. Orbotech and Schmoll had significant presences. Orbotech showed the new PerFix 200 automated rework machine (below), which is three times faster than the 100 model. As for Schmoll, one would think it was Hitachi's much bigger brother. It was a bit eye-opening to hear how Isola has cut its Duren workforce by 700 workers over the past decade yet its laminate output remains the same. UCamco demonstrated the latest version of its Integr8or software, which includes Checkpoint 1.1, a DFM review tool that checks copper, drill, and solder mask files among others and indicates critical errors. The firm also rolled out UCAM-X 1.1, a 64-bit CAM tool that ultimately will replace UCAM, featuring a new GUI and user-defined windows. The company's Karel Tavernier also explained the company is working on an updated version of Gerber with attributes. First EIE had several machines, including the EDI-500 direct imaging system. Finally, we talked to a couple EMS companies, which are also exhibiting in the fabrication hall. Unfortunately, there was nothing notable to report. MUNICH -- Attendance at Productronica picked up in the middle of the week, and the equipment advances for board fabrication on display started to gain some traction. As typically happens at the biennial Munich trade show, the industry's largest outside of Asia, attendance grew on Days 2 and 3 of the four-day event. The fabrication portion of Productronica is truly representative of the European (and Western, really) PCB market. There were fewer suppliers than in previous years, and much of the hall was filled by other companies, including about 15 EMS suppliers. That said, most major materials vendors were here, but equipment, the story was different. Hitachi, which was recently sold, was not. Neither was ESI, the laser drill maker. Imaging equipment was very common, from vendors such as Orbotech, Walter Lemmen, Schmoll, KLG and others. Schmid had several new machines, including a vertical transport D/E/S line, and a digital exposer aimed at more cost-conscious fabricators. The Direct Digital Imager uses diodes that are bunched together and focused in a polygon scanner (right) instead of a UV laser. It's not as fast but highly reliable and low maintenance. Schmid offers both a manual version and the DDI DT, which has a dual table for higher throughput. Also at Schmid, among its four laser drill platforms, was the PicoDrill and the PicoFlex. The latter is multifunctional -- for cutting, profiling and drilling -- although it's not as fast as the former. The PicoFlex was rolled out in 2012 and was being shown for the first time at Productronica. Rainbow Technology displayed its Panda coater, which heretofore had been much discussed but not seen. Polar Instruments showed the Atlas Si SET2DIL, its second-generation insertion loss tester. It also had the latest version of its SpeedStack layer stackup design tool, which now handles rigid-flex and automatically documents press cycles for sequential lamination. Dynachem had its SmartLam 5000 dry film laminator, one of which has been sold to Neuschafer Electronik. It also had the CVA 7125 HP6, a new automatic vacuum lamination line. As mentioned earlier, perhaps the most impressive display was that of Beta Layout, which has partnered with Schmoll to offer a machine for embedding RFID tags. The process involves a robotic placer that picks the tags from a reel and places them into cavities routed or milled in a standard panel up to 18 x 24". An epoxy dispenser then fills the cavity, followed by a 4-minute UV cure. The parts are sized at 3.6 x 1.2 x 0.55mm and the keep-out zone is 10 x 2.3mm, Tony Shoot of Beta Layout said. The chips, from Murata, can be pre-programmed, and come with 512Mb of memory and operate in the 860-960MHz range. The display drew consistent traffic, making it the standout in what was otherwise a somewhat tepid event for board fabrication. Embedded RFID PCB identification system functions as antenna with read distances of several millimetres, and features fast data acquisition, high reading accuracy and the ability to read through enclosures and packaging. By integrating MAGIC-PCB, an RFID PCB identification system from Beta LAYOUT, with Murata’s Magicstrap module, PCBs can now be used as RFID tags. Beta LAYOUT, with its partners in the RFID Value Creators in Electronics’ consortium, is developing tools and designs that enable developers to trial and consider the MAGIC-PCB technique for embedding RFID in prototypes. Murata’s Magicstrap, a tiny and robust component for RFID tag with excellent RF functions and built-in IC, can be embedded in PCBs or surface mounted, and with its UHF frequency band resulting in shorter wavelengths, it utilizes smaller antenna designs than LF or HF chips. An integrated adaptive matching circuit included in its multi-layer structure enables the ground plane of the PCB to be used as an antenna with read distances of several millimetres. The MAGIC-PCB system also features fast data acquisition (simultaneous reading of over 100 tags/sec. ), high reading accuracy and the ability to read through enclosures and packaging. Offering a number of turnkey antenna designs which can be applied to existing PCB designs, Beta LAYOUT also makes available an RFiD starter kit, which includes a read/write device, MAGIC-PCB, antenna modules and Magicstrap samples.